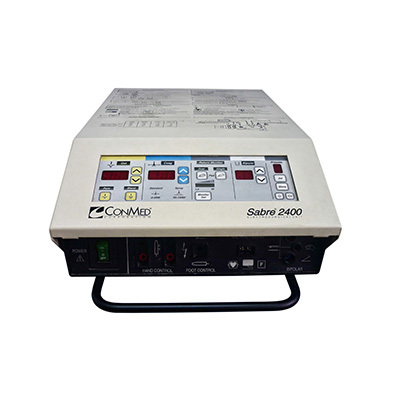 The ConMed™ Sabre 2400™ is a full-power electrosurgical generator to accommodate the needs of all surgical procedures. The Sabre 2400™ easily meets the highly demanding performance needs of electrosurgery. Features independent Monopolar outputs & enhanced bipolar performance. It is safe, convenient, cost-effective, and can be programmed for standardization. Sabre 2400 provides the surgeon with high power performance and key user features to meet demanding electrosurgical needs. It is designed to meet the performance needs of even the most demanding surgeons in demanding surgical applications. Thermal damage free cutting is no problem with the Sabre 2400, with its patented controlled output voltage in the cut mode. As the electrosurgical electrode glides through different tissue types in the cut mode, the Sabre 2400 constantly adjusts the voltage to provide superior cutting performance. Surgeons can also use the Blend mode to achieve greater hemostasis while cutting. Auto spray feature provides superior spray coagulation at power settings above 50 watts. The enhanced bipolar mode provides both hand and foot-switching bipolar coagulation with minimal tissue sticking. 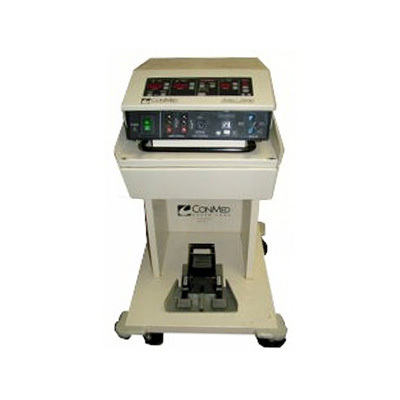 High power electrosurgical unit with footswitch. 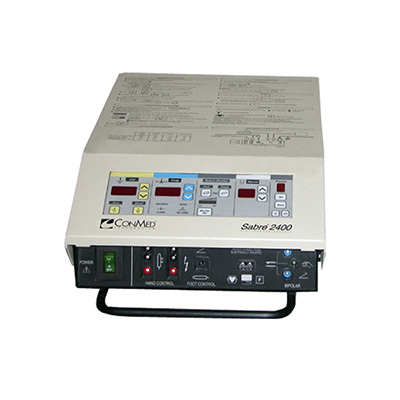 Full-power electrosurgical generator to accommodate the needs of all surgical procedures. 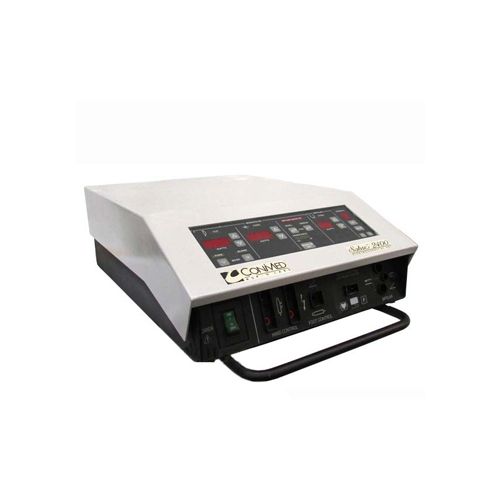 Meets high demanding performance needs in electrosurgery. Features independent Monopolar outputs, enhanced bipolar performance. It is safe, convenient, cost-effective and can be programmed for standardization. Crest Factor: 1.5 - 12.1. With a dual foil dispersive electrode, the Aspen Return Monitor will alarm above 150 ohms, below 10 ohms, and with a 20% increase in resistance above set point. With a single foil dispersive electrode, a two-wire continuity detector alarms at 10 ohms and above. Cut: 416.7 kHz ± 0.01%. Coag: 416.7 kHz ± 0.01%. Blend: 20.0 kHz ± 0.01%. Coag: 25.0 kHz ± 0.01%. Bipolar: 20.0 kHz ± 0.01%. 104-127 VRMS, 50/60 Hz, calibrated at 120V. Pure cut at 300: 7.0A max. Patient connections to neutral: < 25 μA. Chassis to neutral: < 25 μA typical. Less than 100 mA (200 ohms to ground). 1% typical. Pure cut set to 150 watts for 20 seconds.